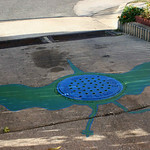 Local teens of Baltimore’s Better Waverly neighborhood joined with artist Sarah Tooley to paint ten sidewalk “murals” relating to sea life around storm drains throughout their neighborhood. The original designs were created by the teens themselves to remind the community to protect our watershed by bringing attention to the harmful effects of littering, street trash, and illegal dumping into storm drains or streets, which drain directly into the harbor. 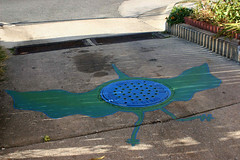 The Sea Creature Storm Drain Street Art project was sponsored by 901 Arts, supported by the Better Waverly Community Organization, Councilwoman Mary Pat Clarke, approved by the Department of Public Works and funded by Kresge Arts in Baltimore- a partnership with the Baltimore Community Foundation. Paint was provided by the Department of Transportation.